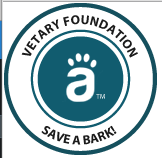 Basset Rescue of Puget Sound is proud to be a partner of the SAVE A BARK program. The act of finding a veterinarian through Vetary results in a donation to BROPS to help save more lives, medical care, and vaccinations. Vetary delivers that care by making cash grants to BROPS specifically for life-saving activities. Just click the Vetary logo and look for your vet. Each time you use a vet through Vetary BROPS will get a donation. This is a nationwide service.